In year 2015, the rock band was formed basing its activities at Nagoya. They perform songs which are based on each member's musical roots of Rock music. 1st one man concert was held in Nagoya ell. FITS ALL after 1 year from band was formed. In year 2017, their regular radio show ZIP FM "MIDNIGHT CHROME" started. On same year, they Major debuted on August 23 on their 1st single "Stand Up Now", which became the Opening theme song for the Anime "KONBINI KARESHI". 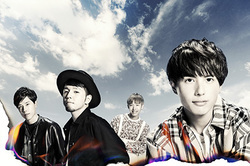 On December 13, they released their 2nd Single "Don't Let Me Down" which has two tie ups. It Became the ending theme for the TV show "BuzzRhythm02" and theme song for the TV show "Osharewa Fuufu ni nattekara". And in year 2018, They will be releasing their 3rd Single "Everything OK!!" which became the opening theme song for the Anime "Detective Conan". On their 1st year anniversary from debut, they released their 4th Single "Adam to eve" on August 22, 2018. Same year of December 26, they released their 5th Single "Aozolighter" which became the ending theme for the Anime Detective Conan.